Character ‘Goyaman’ was first introduced in a 2001 popular NHK television morning drama “Churasan” and became an immediate hit. 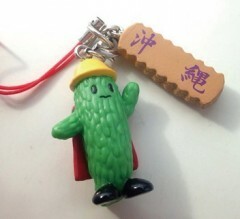 The character is shaped like goya vegetable and he wears a yellow workman’s helmet and red cape. His face seems somewhat bitter as is the vegetable. In the drama, main character Eri’s older brother (played by Okinawan comedian Gori) created the Goyaman to earn money, however, nobody would buy it, so his business was a failure. The drama was about Okinawan culture and history, and helped to make Okinawa and the Goyaman popular and famous. One can still find him at some souvenir shops on Kokusai Street, although it’s has become increasingly difficult to find him nowadays.